The thing is that good habits take a long time to build. If you have just gotten your very first puppy, I’m sure you’re clueless. After all, isn’t ever first-time dog parent confused (and a little terrified)? It’s all natural, though and training a puppy isn’t rocket-science. All you need to train a puppy is a little consistency, patience, and time. In today’s blog post, I’ll help you figure out how to train a puppy and go through all the concepts that you need to know so that you can train your little pup right. I’ve also included a lot of resources to make things easier for you. So, are you ready to learn how to train a puppy? Chapter 1: The Puppy Training Basics and Pavlov’s Behaviorism for Training a Puppy! Chapter 3: Why Hitting Your Puppy is NOT a Good Idea! Have you ever heard about a Psychologist named Pavlov? You must be wondering what a Psychologist has to do with training a puppy. Ivan Pavlov was a Physiologist who won the Nobel Prize in 1917 for his research on the digestive system. And, he found one strange thing during his research. His test subjects were dogs and he discovered that the dogs salivated in anticipation of food at the sound of the bell which he rung before feeding them. And, Classical conditioning was born. But, how is this relevant? It is the very concept of ‘Classical conditioning’ and that of ‘Instrumental conditioning’ which we use when training a puppy. Don’t worry! I’ll only teach you the basics. What happened is that when you pair the sound of the bell with the food, the dog starts to pair both of the stimuli. This means that the dog simply thinks that food will always come after the bell is rung. And, it is this anticipation of food that makes the dog salivate at the sound of the bell. So, in a way, the bell acquires the natural response (salivation) the puppy makes to the food. The concept of classical conditioning has long been used in training dogs—from basic to advanced commands, the concept works on them all. Your dog can forget the commands learned as well. Yes, extinction does take place when you’re taking the help of Classical Conditioning to train your dog. So, how does extinction take place? Let’s take the example of the dog food and bell that I talked about earlier. Let’s say you kept ringing the bell, again and again. But, you don’t give the puppy food. After a point of time, the pup will just stop responding to the bell. So, what I’m trying to say is that if you present the conditioned stimulus to the dog without giving them the unconditioned stimulus, then, they will stop responding after a time. So, always keep that in mind. In this section of the blog, I’d like to dive into the concept of reinforcements and their types. As you know, this article is an Ultimate Guide, and that’s exactly what I’m giving you! It is an outcome or consequence of a behavior which increases the likelihood of that behavior repeating again. Reinforcement is sort of a ‘power’ the increases the probability of the response. So you see, if you give your dog a ‘treat’ for behaving the way you want him to then the dog will behave well in order to get the treat again. There are actually two types of reinforcements that you can use to train a puppy. Now, let’s talk a little bit about each one of these, shall we? The Positive Reinforcement: What Puppies love! Scroll up to the example that I gave you about commands and treats. That’s positive reinforcement for you. Positive reinforcement includes things that your puppy likes and wants. It could be a new toy, some treats, or even your affection! So, how do you get about using positive reinforcement on your puppy? Well, after your puppy does something desirable (like for example, it relieves itself outside) you go ahead and give your puppy something that you know they’ll love. Ever got grounded when you were a teenager? So, how can you use negative reinforcement in your puppy? I’ll give you two examples. Let’s say that you’re out and your puppy is alone in the house. You come back and find your shoes destroyed. In situation 1, the puppy will realize that you are angry with him and try to please you. Dogs are intelligent, they know what they’ve done. People all over the globe spank, hit, and even beat their puppies when they do something bad. It’s usually a cultural thing. This is called the aversive technique. So, what happens in this technique? Whenever a puppy does something wrong or behaves badly, he is simply hit. People who follow this technique argue that it is the pain that will later discourage the doggy from repeating the bad behavior. Sometimes it does. But, it is too risky. The thing is that the puppy comes to the realization that it is you (the owner) who inflicts the pain on him—and that it is NOT the natural consequence of his action. So you see, hitting a dog is like walking a tightrope. Your puppy can have serious antisocial personality traits if you punish him by inflicting pain. In this section of the article, I will teach you how exactly you should go about in training your puppy. I will also share some resources that I’ve found extremely helpful when training a dog and more. And, if you have a Frenchie, then I have some extra tips that’ll help you train your French Bulldog. Let’s start the class, then! So you’ve just got your little bundle of joy and you’re excited to start your life as a family. But, did you know that the first week is critical for training a puppy? And that’s why before you get your puppy home, you should make the rules and stick to them no matter how hard that is. Will the dog be allowed on the furniture? Will the dog be allowed in the kitchen? Who will feed the dog? Who will clean after the dog? During the first week, your puppy is young and impressionable. The puppy has also been separated from the mother and other littermates and doesn’t know what’s going on. You just got your puppy and it’s really adorable. You had previously decided that the puppy won’t be allowed on the bed, but you just couldn’t say no to that adorable face! And guess what’ll happen a year down the line? Your dog will sleep on your bed. What I’m trying to say is that you are the one who makes the rules for your dogs. And so, you should be the one implementing as well as following them. No matter how cute your puppy is! I’ve been there and I’ve done that. New puppies have no idea about which place is appropriate to eliminate and so they tend to go wherever they want to. Now, it is your duty as the puppy’s owner to housebreak them. But, how do you housetrain a puppy? That’s exactly what I’ll be covering in this section of the article. In this section, I’ll go through how the environment around your puppy can help in house training your puppy. It shouldn’t come as a surprise that the way your puppy views the world is entirely different than the way you view the world. Your puppy doesn’t know what you consider right or wrong. This means that your puppy really doesn’t understand that it is a bad thing to pee on your rug. For him, it’s perfect spot! You need to teach your puppy the difference between right and wrong. Alos, sometimes your views aren’t exactly the right ones for your puppy friend either and the thing is that pups can’t talk. But, you should never shave a pup. Read more about shaving a dog. First of all, you should know when your puppy can go outside. So, how do you go about teaching your puppy to go outside? You’ll have to rely on coincidence. Take your dog out when you see a ‘cue’ that gives you the impression that he wants to go to the toilet and praise him when he goes. It won’t take your puppy a long time to catch on. The thing is that your puppy is too small to ‘hold’ his bladder and bowel movements. So, don’t punish the puppy just because he had an accident. Your puppy is really small. So is his bladder. Following is a chart that’ll help you understand your puppy’s natural constraints better. Apart from that, your dog’s breed also matters when you’re training your puppy. So this means that French Bulldog puppies are harder to train than Golden Retriever puppies. Mixed breed dogs like the Doberman Lab mix, Pit Lab Mix, Newfoundland Lab Mix, and the Border Collie Beagle mix are known to be very intelligent and quick learners as they get the best of both of their parents. Puppies don’t like to pee or poop near the places they sleep. So, if you’re away from home too often, consider crate training your dog to avoid accidents all over the house. Before you take your puppy out for a wee, you need to find a perfect spot for your puppy to go. Don’t change the ‘potty’ spot often or it’ll confuse your pup. And that’s about it for this section. Let’s got to part 2, shall we? In this section, I’ll go through the importance of routine and consistency when you housebreak your new puppy. 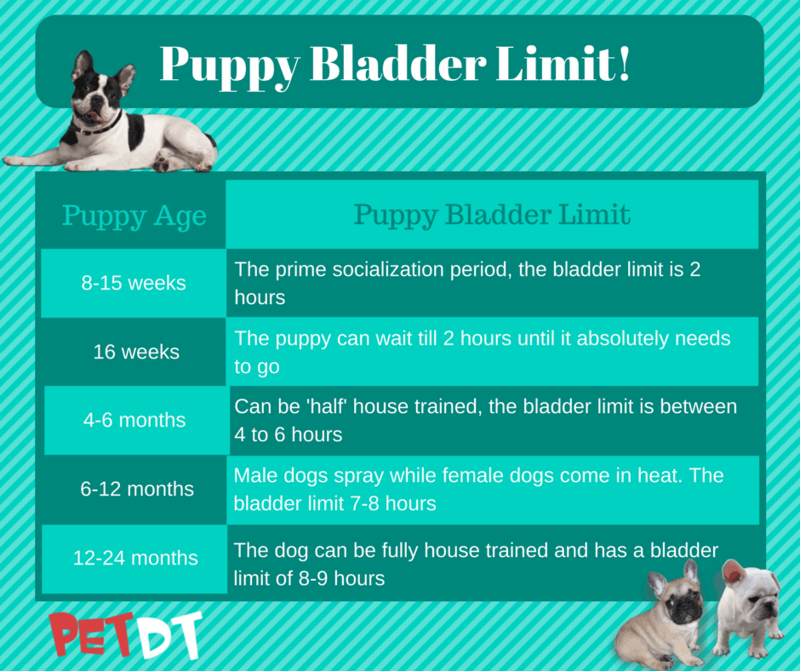 Rather than letting your puppy eat whenever he feels like, put him on a schedule so that you know when to expect the next bowel or bladder movement. This will help your puppy get used to his life and it will also make it easier for you to housetrain your pup. All you have to do is take your puppy out after 15-20 minutes of feeding him and you’ll be golden! But, also look out for signs like dry heaving in your puppy as they can be potentially fatal if ignored. A potty schedule is also as important as a feeding schedule. Keep in mind that consistency is key. You will see the number of accidents drastically declining! The best way to get started with housebreaking your puppy is starting from day one. Give your puppy some water to drink and take him out to the ‘potty spot’ and praise the new pup when he goes! Your puppy will be feeling like going long before he actually does. And he’ll try to let you know. When you see any of these signs then you should know that your puppy needs to go. It’s a good idea to associate a command with going potty. After all, it’s easier for your puppy to understand you. All you have to do is say “Go potty” or “Hurry up!” every time you take the dog out to do his business and you’ll be good to go. I’ve talked about positive reinforcement earlier in this article. And that’s what you need to apply to potty training your puppy friend. After your dog goes potty outside, all you have to do is praise the little guy and give him a nice treat to let him know that he’s done a good job. Let me know in the comments section if you found this section helpful in training your new puppy! In this section, I’ll go over the five basic commands that your puppy absolutely needs to know. If you are successful at properly training your puppy all five of these commands, it will be easier for you to teach your pup other advanced commands. The ‘sit’ command is used when you want your dog to wait patiently for you and it’s one of the first commands you should teach your puppy. The lay down or the “Down” command is used to help control your dog’s behavior. So, naturally, all the activity that your dog had been doing before you gave him the command must come to a halt. Start with the ‘sit’ command and then tell them to do “down” as you lower the pup’s head to the floor and give him a treat. This is also called the recall. The basic idea behind this command is that your dog should come to you whenever it is called, including coming inside. And, this command can prove to be helpful when you let your dog off the leash later in life. This command is a really important one. In fact, in a situation critical, it can even save your dog’s life. This helps you keep your dog out of trouble. Gradually increase the stay time. Out of the five basic commands, “Heel” is the hardest and the most complicated to teach. Always keep in mind that consistency is key when you’re teaching your dog these basic commands. Sometimes dog treats can be expensive. Especially if you’re on a budget! So, I recommend that you invest in some cheap dog food and feed it to our dog as ‘treats’! In this section, I’d like to talk about the three main behaviors that you should put an end to during puppyhood and the training period. Dogs use their mouths to express their feelings. They lick you when they’re happy, bark when they’re threatened and bite when they’re playful. And biting is a part of rough play. Like I’ve said before, puppies don’t really know what’s right or wrong to their humans. And, they use their mouths an awful lot when playing with their littermates. So, how can you teach your dog not to bite or nibble at you? I’ll help you out with that! As soon as your puppy bites you during playtime, use the word “ouch” and proceed to ignore the puppy for 20-30 seconds. You’ll obviously have to repeat this process again and again. The idea behind this is that your puppy will soon realize that he hurts you and will not indulge in rough play. Other than that, you can always invest in some good chew toys for your puppy. I’ve listed a few that’ll be amazing for your puppy. It is always a good idea to check your puppy for signs of any problems and one of these is pale gums in dogs. It can be a sign that something is dangerously wrong with your pup! Puppies are always excited and full of energy. And they like jumping up on people as well as things! But, that can be annoying. So, in this section, I’ll teach you how to keep your puppy from jumping on you. I do recommend that you start grinding your puppy’s nails during this time to avoid getting scratched. So you’re sitting on your couch and your puppy comes over to greet you by jumping on you. You pick the little guy up and give him cuddles and kisses, unknowingly reinforcing your puppy’s behavior. The best way to stop a bad behavior (like jumping) is to just ignore it. If your puppy comes to you and jumps at you for cuddles, don’t give him your attention. The thing is that your attention also acts as a reinforcer for your puppy friend. So, it is not really a good idea to scold the puppy (or cuddle him) if you’re discouraging a behavior. You may feel that it is okay to let your puppy jump on you once in awhile. If you’re inconsistent and allow your puppy to jump on you every now and then but scold him if he does that normally then you’re sending him a completely wrong message. So, if your puppy is not allowed to jump on you then that is it. Teaching your puppy not to jump on you can be frustrating. Maybe that’s why dogs sometimes eat their puppies. Especially when your muddy puppy jumps on your clean clothes. But, keep in mind that scolding and hitting your puppy is (and never will be) the answer. This is the perfect time to also start grinding your puppy’s nails to get him used to the feeling. You’ll thank me later! Read more about grinding nails here. This is one problem that dog owners face when they leave a puppy alone for too long. A puppy cries or whines when left alone because it is scared and alone. So, you see, the whining is actually a cry for help. Your puppy wants your to rescue him and make things better. But, it can also be annoying. Keep in mind that the probability of a puppy whining increases exponentially when he’s confined to a small and dark place (like a crate). Like everything else, training a little puppy not to whine can take a lot of time. Always keep in mind that your puppy is way too young and insecure. And it is a fear of separation and insecurity that makes your puppy whine. After all, your puppy has never been left alone before. Puppies are pack animals and they’ve literally had company in the womb! And they’ve grown up with their littermates. So, living in a house is difficult for a puppy at first. Puppies will inadvertently grow into adult dogs. So, some things that are “cute” during puppyhood aren’t so cute in doggy adulthood. And so, it is important to teach your dog about boundaries during puppyhood itself so that the little fellow can grow up to be a good and well-behaved doggy. How Should You React to Bad Behavior? We all like to give our puppies the “Puppyhood pass” in which we basically allow the tiny ones to get away with anything. But, that’s the root cause of bad behavior. In this section, I’ll talk about how you should deal with your puppy’s bad habits the right way. And they get to know what’s acceptable and what’s not at a very small age. So, I advise you to use this to your benefit. You should ideally start training your puppy from the moment you get him and keep the training sessions short and sweet. This is the perfect time to nip the early signs of behavioral problems in the bud. Rewarding your puppy helps the tiny one understand what is acceptable. And, your dog will also get to understand the things that he’s doing wrong. In order to give your puppy the right rewards, you should know what motivates your puppy. Each and every dog is unique, after all. By definition, a reward must be something that makes the puppy happy. So, make a point to figure out what your doggy likes and give him some positive reinforcement. Puppies try to catch your attention. So, if your puppy jumps at you, barks at you, or nibbles at your fingers you should just ignore him. The thing is that these behaviors aren’t self-rewarding. And, as soon as your puppy realizes that there’s absolutely nothing for him when he nibbles at your fingers, he’ll stop indulging in it. When you don’t give your puppy any attention, he realizes that he needs to make changes in his behavior in order to get it. Did you catch your puppy chewing on your shoes? Well, the best thing that you can do is to distract the little guy and use the command “NO!” to teach your puppy that it is unacceptable. How can you distract your puppy? Well, a loud noise tends to do the trick. However, never call your dog by its name when scolding him. Hold on! There’s one more thing! You need to redirect your dog’s energy onto something else that he’s allowed to do. So, this means that if you find your dog chewing on your shoes, you should command your dog to stop and then give him something that he CAN chew, like a toy. This will help your dog understand what he can and can’t chew. Keep in mind that dogs of all ages have accidents. You can scold your dog. But, like I’ve mentioned before in this article, you should NEVER hit your puppy in order to discipline it. Hitting your puppy can ruin your relationship with the little guy for life. I really hope that this blog article helped you in training your puppy. I’ve tried to cover as many subtopics as I can. I’ve also included basic topics such as conditioning and reinforcement in this blog so that you can understand (and apply) these basic principles to your dog’s training schedule. Training your dog can be fun, and it can also be frustrating. Be gentle with the little guy and patient! Keep in mind that dogs are intelligent beings and they catch onto things really quickly! Puppies are tiny yet intelligent beings. But, they don’t have a sense of what’s right and wrong and so, it is your duty as a dog owner to teach your dog the difference between the two and make him a good doggy. Did you find this blog interesting? Let me know your thoughts in the comments section and I’ll get back to you! I just wanted to know one thing: What can I do with my teething golden retriever. she don’t listen to me……? I started training my puppy when she was 6 months old. I guess, I should have started sooner…. By that time she wouldn’t listen to my command and had become such a brat. I FINALLY had to hire a professional trainer. I think you should write something about professionally trained dogs / professional trainers as well.